Virtually every time I ask someone if they’ve heard about the new play Mr Foote’s Other Leg, most say: “Is that about Michael Foot?” Deep breath. No, it’s about the eighteenth century playwright, satirist, actor, theatre owner and impresario Samuel Foote. In his day, he was massive: one of the most famous men in London, the equal of Garrick. But the great news is that – largely thanks to historian Ian Kelly – Foote is emerging triumphant from the 21st Century shadows. First there was Kelly’s biography of 2012, then his play which has just ended its sold-out run at the Hampstead Theatre. However, the biggest boost to the old Georgian trouper was the play’s transfer to the Theatre Royal Haymarket on Wednesday for a limited run as we reported recently. The significance of this cannot be overstated, for this was Foote’s own playhouse and the royal warrant was granted to him personally. Samuel Foote has come home. But what about the play itself? It is very funny. It has to be, because Foote himself was the funniest man in London. From the opening scene with Frank Barber and Mrs Garner rifling through John Hunter’s laboratory, the audience is roaring and this continues throughout. There are constant witty asides aimed at luminaries such as Samuel Johnson, David Garrick and in particular, Handel – celebrities one and all on the London scene. But this being Georgian London, Handel and Germans in general draw most of the fire, reflecting a casual xenophobia which today is practically illegal. 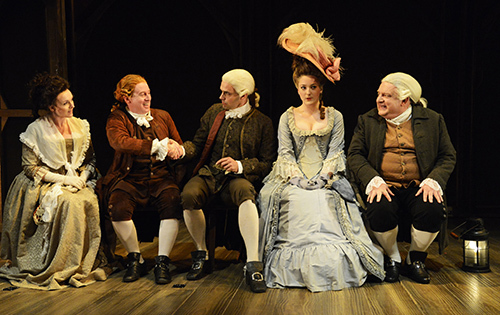 As a whole the play covers the trajectory of Foote’s professional life starting as new boy from Cornwall at Charles Macklin’s informal acting academy (a brilliant ensemble scene) through the toast of Georgian London to life-threatening accident, mental illness, scandal and ignominy. 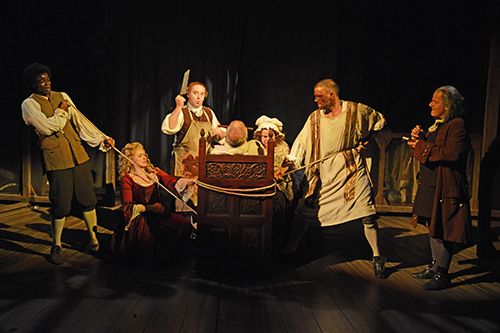 As the play progresses, so too does the comedy darken and the scenes become charged with sadness, not just for Foote, but those around him too. For his is loved. The transformation of mood is skillfully paced. Kelly’s aforementioned book is deeply researched and scrupulously delivered. This is not an imperative with drama, so he takes liberties which don’t affect the gist of the story one bit but add much colour (literally in the case of Frank Barber who was Samuel Johnson’s black butler, not Foote’s) and help to keep the audience more closely connected. The surgeon John Hunter, though well enough acquainted with Foote, did not actually perform the amputation of the actor’s leg. Benjamin Franklin – resident in London for some sixteen years – didn’t loom large in Foote’s world, but here he is, talking frequently direct to the audience in a sort of chorus role (a neat touch is whenever Franklin is on stage we hear the eerie sound of the daft musical instrument he invented – the glass armonica). And so on. All the perfomances are wonderful with special mentions to Jenny Galloway as Mrs Garner (hilarious) and Dervla Kirwan as Peg Woofington (hilarious and tragic, both). 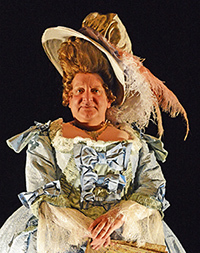 But what makes this play really tick is the outstanding performance of Simon Russell Beale. He looks just like Foote, he has taken possession of Foote and Foote in turn possesses him. He takes the funny bits, the poignant bits, the heartbreaking bits and makes them sing. Great, great acting. 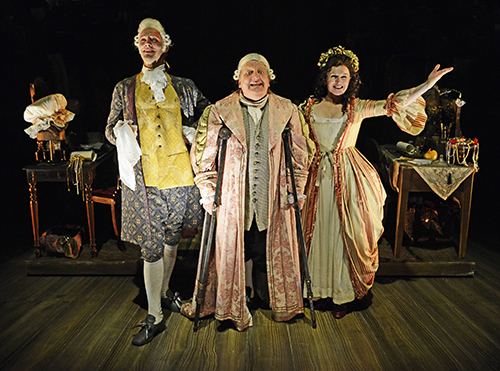 Mr Foote’s Other Leg is written by Ian Kelly, directed by Richard Eyre and will run at the Theatre Royal Haymarket for 12 weeks. The operation. Gasps from the audience! Featuring a newspaper Sunday tabloid headline on the dust jacket, it is a series of scandals that provide the framework for this new publication. Dealing with mainstream history of Notting Hill as told by the newspapers, the chapters are divided by the events that achieved notoriety and captured the imagination of the popular press. 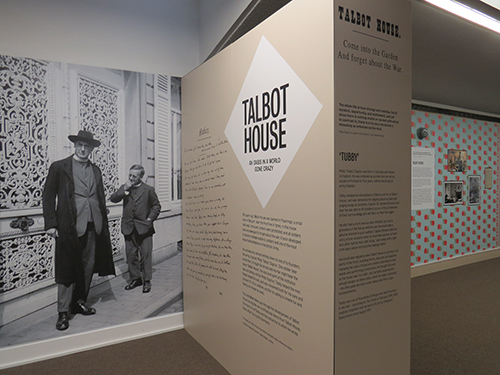 The well known tales of 10 Rillington Place; The Profumo Affair; Notting Hill Riots and the demise of designer Ossie Clark are narrated as seen through the reports of newspapers and public perception. 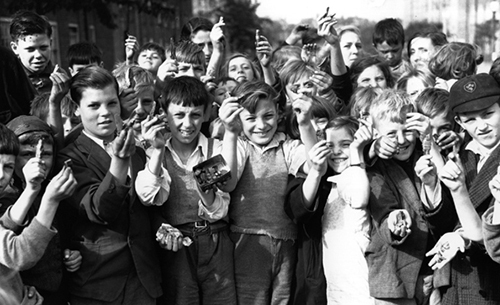 The early development of the built environment is nicely covered although there is much history of the area that has been left out, however that is not much of a criticism given that the aim is to tell the more notorious story of Notting Hill, in doing so it has been well researched and set out in an entertaining format. It ends neatly with a sharp and accurate observation of how Notting Hill has come full circle over the course of two centuries, again drawing on the public persona of the area with an adroit summing up of the district today. For anyone with a passing interest in the area this is a well written book. For those familiar with the history of Notting Hill it is not relating anything that hasn’t been written before. However, having read it from both the point of view of an historian and someone who has known the area well and seen it change over many decades it can still be recommended as an interesting read. 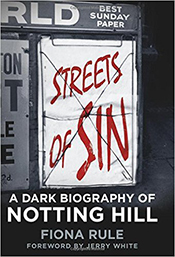 Streets of Sin – A Dark Biography of Notting Hill, 224 pp, by Fiona Rule, is published by The History Press. Hardcover. Cover price £15.99 but available for around £15 or less. Kindle edition available. … or pleasing things to know about the great London artist. I’m sure that like me, you hold Hogarth as one of your favourite Londoners. Every year we remember him often, but especially on his birthday, 10 November (1697) and the day he passed away – today, 26 October (1764). Here’s a little crib sheet of Hogarthiana. Although of humble beginnings in Smithfield, Hogarth lived to become Sergeant Painter to the King. Like Dickens, his father went to debtors prison, having gone bust running a coffee house where only Latin was permitted to be spoken. It was in St John’s Gate, Clerkenwell. Even by the standard of the day, Hogarth was a shortarse, standing only five foot tall at the most. His father-in-law was Sir James Thornhill, celebrated in his day, but less well known now. Thornhill painted the inside of the dome of St Paul’s Cathedral, the Painted Hall in Greenwich, and the best known life portrait of notorious prison escapee, Jack Sheppard. Hogarth was a key figure in the foundation of copyright under the law, thanks to his lobbying for the Engravers’ Copyright Act in 1735 (aka “Hogarth’s Act”), which, with subsequent variations, still protects musicians, artists and other creative professionals to this day. Hogarth was a founding governor and great supporter of Captain Coram’s Foundling Hospital. 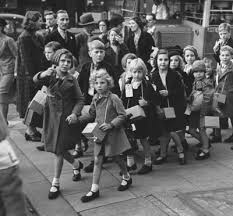 He and his wife Jane supervised wet nurseries near their home in Chiswick for babies from the institution. The couple never had children of their own. 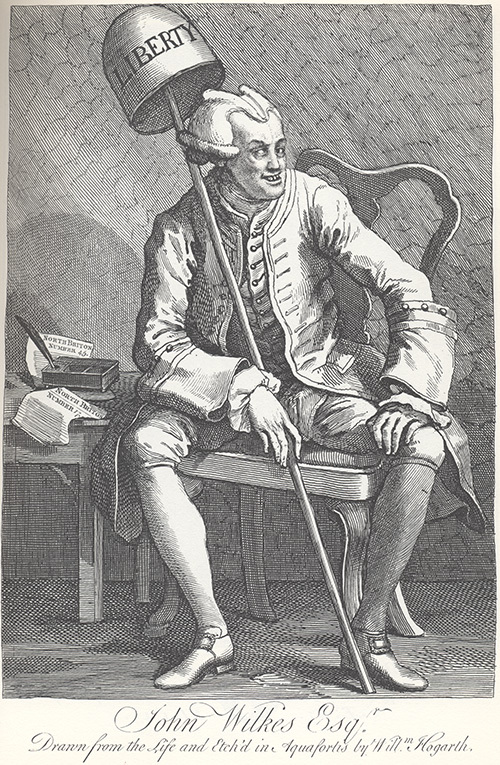 Hogarth, having been criticised by charismatic political firebrand John Wilkes, created arguably the best-known image of the politician, a vicious caricature. 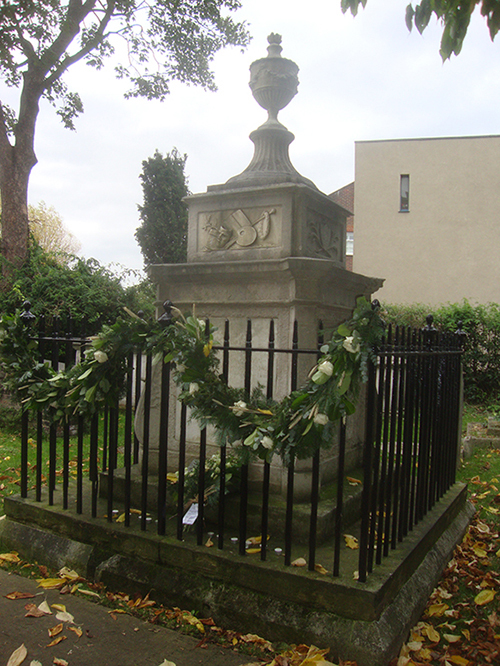 The Hogarth family tomb in Chiswick was endowed by the actor David Garrick, a great friend of his. Hogarth ordered a trade card for his pug, Trump, from a printer at one of the Thames ice fairs. 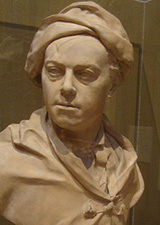 On his only foray beyond these shores, Hogarth got arrested in Calais in 1748 – ostensibly for spying. This didn’t help to disabuse his jaundiced view of foreigners and their ways. There are, of course, many many other pleasing Hogarth things. Please add your own in the Comments. 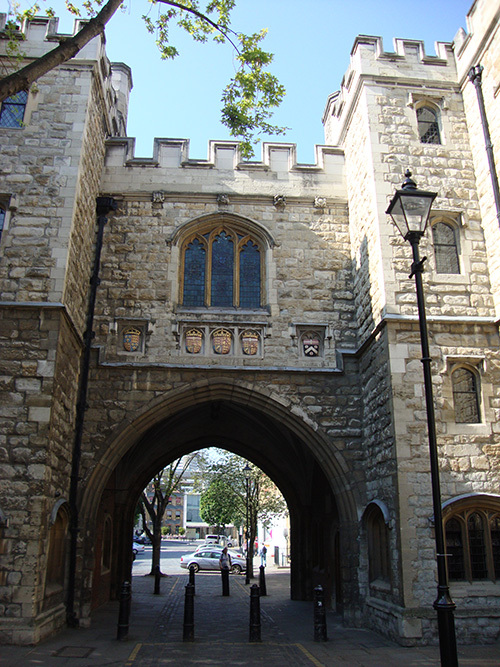 St John’s Gate, Clerkenwell, site of Hogarth Senior’s ill-conceived coffee house. 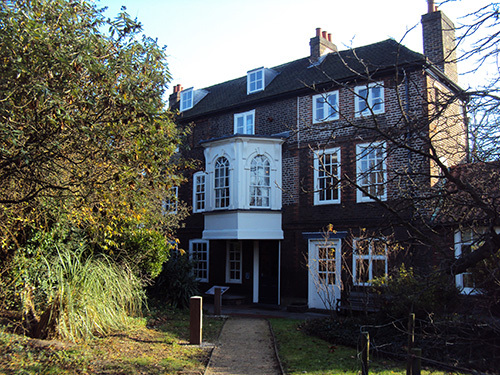 Hogarth’s House, Chiswick. The artist’s country home 1749 until his death. Hogarth takes a pop at John Wilkes. Hogarth family tomb. St Nicholas churchyard, Chiswick. 2014 on the 250th anniversary of his death. At least two leading illustrators of Punch magazine in the mid-20th Century were warriors of World War I. Kenneth Bird (“Fougasse”) was seriously wounded in Gallipoli and went on to be the first cartoonist to edit Punch. And EH Shepard, OBE, MC (1879 – 1976), who saw extraordinary action in three theatres on the Western Front before serving in Italy. Most of us know EH Shepard as the illustrator who gave us the Christopher Robin, Pooh and Piglet we all know so well, not to mention Ratty, Toad et al in Kenneth Grahame’s Wind in the Willows. After the war and for over 30 years afterwards, he provided cartoons and illustrations for Punch and other popular publications. But during the war itself, during those long boring lulls between short outbreaks of terror, blood and death that soldiers know so well, he produced hundreds of sketches in pencil and ink as well as watercolours. Shepard was born in London in 1879. In 1915, he signed up at a relatively advanced age of 35. He joined 105 battery Royal Garrison Artillery (RGA), with whom he remained for the whole confict. Extraordinarily, he saw action at the Somme, Arras and Ypres (Passchendaele), virtually unscathed. In fact, he unwittingly gained a reputation for being lucky to the extent that superstitious comrades began to stick close to him. This is all the more extraordinary given that he did spells as a forward observation officer (FOO) whose survival time typically was measured at under an hour. This was in stark contrast to his brother who was killed quickly and early in the Somme campaign. At the war’s end 105 battery was fighting in Italy. By this time Shepard had been promoted to major. 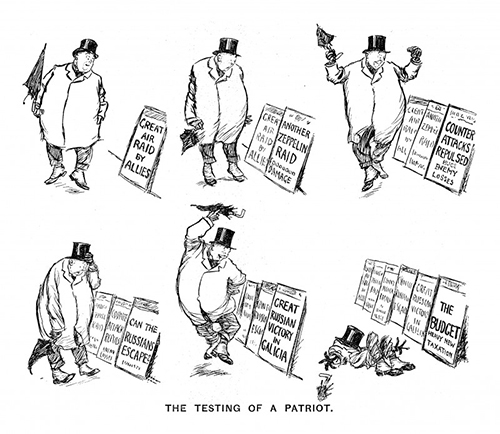 The Testing of a Patriot, 1915. Reproduced with permission of Punch Ltd.
To commemorate the centenary of EH Shepard’s joining the Great War, the House of Illustration has an exhibition of his wartime output. Amazingly, through much of the campaign he continued to do commercial work, particularly for Punch. And it’s hard to know what to think when he got a letter on the front via his wife, from his agent urging him to maintain his output! The show features a lot of correspondence, mainly between husband and wife, which reminds us of the staggeringly efficient postal service to and from the troops and also reminds us how close was the Western Front to London geographically. 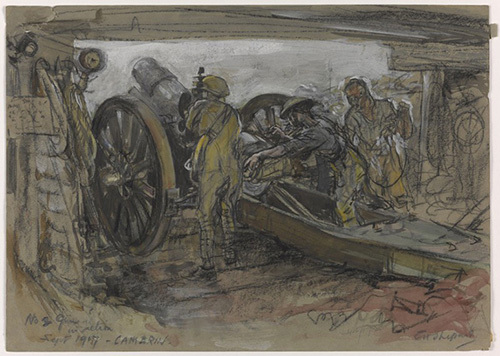 No.2 Gun in Action, September 1917 © EH Shepard + IWM. The show also features other ephemera such as diaries, the artist’s watercolour palatte, bits of uniform etc. But mainly it’s all about the illustration. While most of it was created to amuse – both on the front and in the pages of Punch – some of the illustrations were created for strategic purposes, so we have beautiful wide landscapes with grid markings, for example. Some of the early Punch work features propagandistic anti-German stereotyping, mostly very funny if taken in context (and possibly even if not). 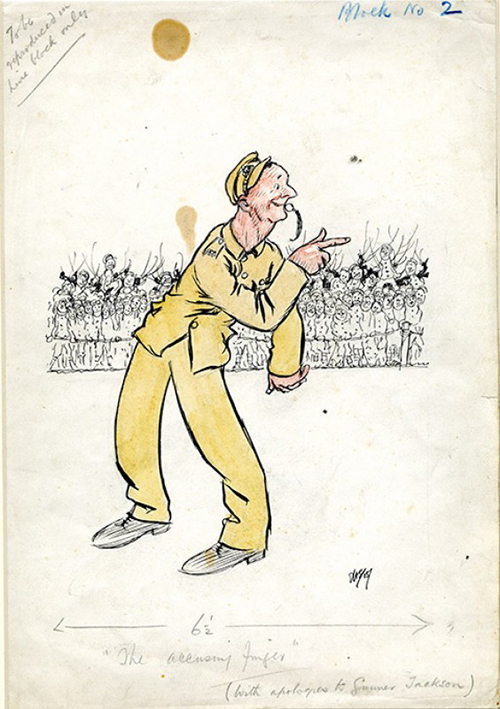 We have examples of caricatures of fellow soldiers, Gunner Jackson refereeing a football match is perfectly done in its simplicity, you feel you know him well. 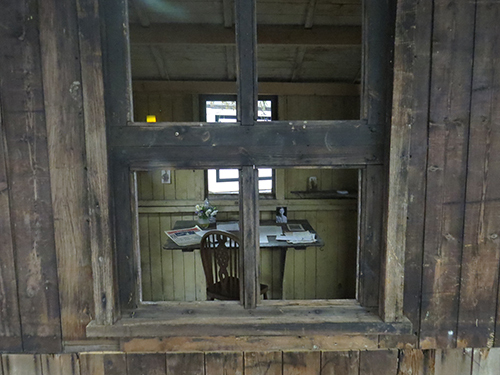 The final room features work by Shepard in the decades after the conflict. He didn’t dwell on it much – proper heroes tend not to – but he was always available to do illustrations for programmes or menus relating to reunions, some of which are featured. ‘The accusing finger” (with apologies to Gunner Jackson) From the EH Shepard Archive, University of Surrey. This is a wonderful exhibition which reinforces that which we already know: that EH Shepard was a massively talented illustrator who effortlessly produced work to raise the spirits of those in the most stressful circumstances imaginable, work which shines just as brightly a hundred years on. EH Shepard: An Illustrator’s War runs until 24 January 2016. A guest post by LH Member Anne Carwardine. As a woman, if I had wanted to observe proceedings in Parliament two hundred years ago I would have had to crane my neck and peer down through a ventilation shaft. One hundred years ago I would have been in the Ladies Gallery, high above the Speaker’s Chair, with a heavy metal grille blocking much of my view and making it difficult to focus. (Campaigner Millicent Fawcett described this as like looking through a gigantic pair of spectacles which did not fit). 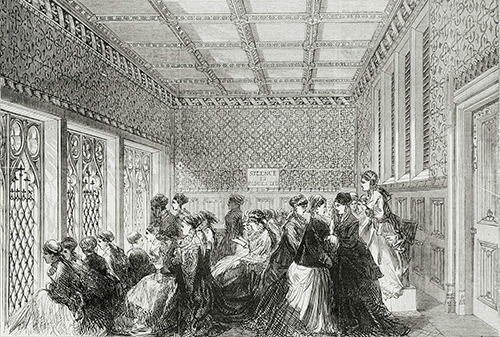 On a recent tour of Parliament, which focussed on connections with the Votes for Women campaign, the group I was in (mostly women) stood on the floor of the House of Commons looking up at the Ladies’ Gallery and wondering what it would have been like to be confined there. 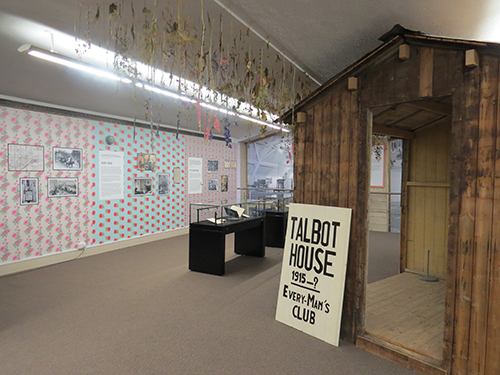 In October 1908 Muriel Matters and Helen Fox of the Women’s Freedom League chained themselves to the grille, while Violet Tillard lowered a banner demanding that women be given the vote in the current session. The grille had to be removed temporarily in order to saw off the protestors’ chains; it would be another nine years before it was removed permanently and another ten before any women were able to vote. Beyond doorways to each side of the Commons we could glimpse the division lobbies, through which MPs pass when there is a vote. In November 1910 Emily Wilding Davison, one of the more militant protestors and most famous for her death at the Epsom Derby, threw a hammer through a window between the lobby and the main chamber. We returned through the Central Lobby, where the original grille from the Ladies Gallery has been installed as a reminder of how things once were. Opposite it is a tall bronze statue of Margaret Thatcher (apparently she was disappointed that it was not made of iron). I had the impression that there were differing views in the group as to how much she did for women. Next was St Stephen’s Hall, with statues of Walpole, Seldon, Somers and Falkland. In April 1909 four members of the militant Women’s Social and Political Union (WSPU) chained themselves to these statues to advertise a rally at the Albert Hall. You can still see where the spur of the Falkland one was broken off during this incident. No longer visible is the passage from the Bill of Rights which campaigner Marion Wallace-Dunlop (the first hunger striker) printed on the wall, having smuggled in a small printing press. 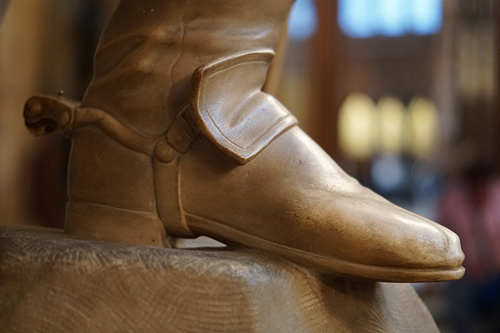 The boot with broken spur on the Falkland statue in St Stephen’s Hall. 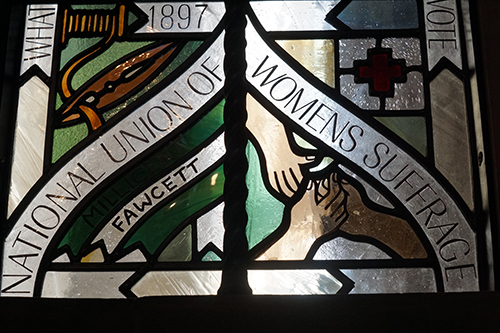 In one corner of St Stephen’s Hall is a more recent memorial to the suffrage campaigners – a tall stained glass window, designed by Shona McInnes, which was installed in 2002 and incorporates symbols, such as handcuffs, connected to the movement. Disappointingly we did not have the opportunity to see the cupboard in the Chapel where Emily Wilding Davison hid in on census night, so that her address would be recorded as the Palace of Westminster, with a plaque that Tony Benn had installed to commemorate this protest. The talks which followed the tour were mainly concerned with art in the Houses of Parliament. Unsurprisingly, given the male bias of most of the institution’s history, representations of men predominate. However, the Speaker’s Advisory Committee on Works of Art has commissioned artist Mary Branson to create a piece to honour the women’s suffrage campaigners. Entitled ‘New Dawn’, it will consist of a sun made up of many glass circles, lightening and darkening in synchronicity with the Thames’ tides, and will be installed at the entrance to St Stephen’s Hall in 2016. Sunrise was an image used frequently by suffrage campaigners and so this seems an appropriate memorial to them. 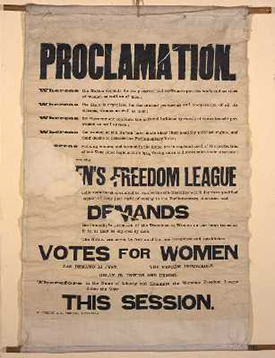 The recent release of the film ‘Suffragette’ has drawn attention to the Votes for Women campaign, much of which was played out in London. I am currently working on a book about campaigners including Violet Tillard from my home town of Tunbridge Wells. The Sufragette Season of tours at the Palace of Westminster runs until the end of October. You may get on if you’re quick. Look here.